LOUD AS HELL Festival Announces 2019 Line-Up w/ Goatwhore, Anciients, Cloven Hoof, Planet Eater, Untimely Demise, BornBroken, Arrival of Autumn, Legacy, VX36 and more! BornBroken, Arrival of Autumn, Legacy, VX36 and more! Loud As Hell 2019 Line-Up Spotify Playlist here. Loud As Hell, the incomparable Badlands metal fest has just released their lineup for the 2019 rendition and it’s an absolute banger! The headliner for this year is New Orleans’ GOATWHORE who will be melting faces with blackened death metal while the sun melts everything else. The 3-day fest will feature 40 bands in total over the course of the weekend in Alberta’s scenic Drumheller badlands at the Dinosaur Downs Speedway on August 2 – 4, 2019. In its 8th year, Loud As Hell has seen acts from all over the world come to the sleepy town of Drumheller, which is also the dinosaur capital of the world. Over the three days, old friends and new enjoy camping, free pancake breakfasts and a slew of bands from across various subgenres. This year, talent comes from around Canada as well as USA (Goatwhore, Thrust, VX36), England (Cloven Hoof), Mexico (Legacy). Tickets for Loud As Hell 2019 are $100 CAD and includes camping. They are available through https://www.loudashell.com/tickets. 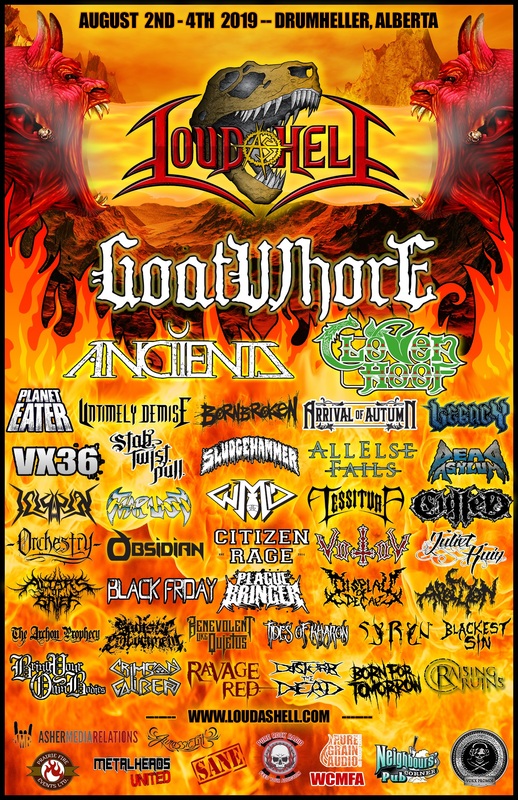 Anciients Arrival Of Autumn bornbroken Cloven Hoof legacy LOUD AS HELL Festival Announces 2019 Line-Upw/ Goatwhore Planet Eater Untimely Demise VX36 and more!